Director Shawn Levy is releasing a new movie in June of this year named The Internship staring Vince Vaughn and Owen Wilson. Googlers seem to be very excited about the movie. Why? 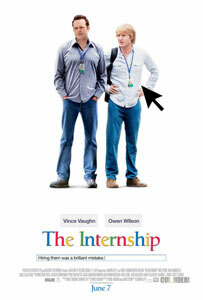 Well, the cover of the movie has Vince Vaughn and Owen Wilson standing on a Google-like home page, with a search box. The movie is about two sales men who switch careers and go into the technology world. They know very little about technology, so it makes for a good comedy.